Have you seen the little tubs of Philadelphia Cooking Cream in your local grocery stores yet? No? They are there, go look for them and they even have recipe cards on them! 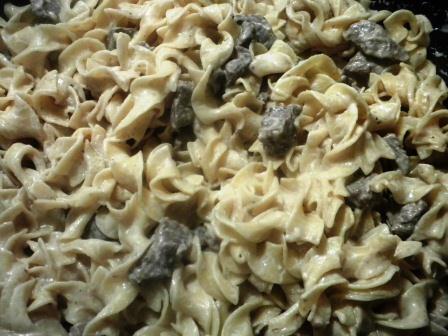 This Beef Stroganoff recipe not only called for the Philly Cooking Cream, but I doctored up the Beef Stroganoff recipe with some Mrs. Dash Original Seasoning Blend to give me more flavor without all the sodium. My family LOVED it! Oh yeah… yum! COOK meat and onions in large, nonstick skillet on medium heat 5 to 6 minutes or until done. Remove from skillet; drain. Cover to keep warm. Add butter to skillet; cook until melted. Add remaining seasoning. ADD cooking cream; cook and stir 2 minutes. Return meat to skillet; stir in broth. Cook 5 minutes then remove from heat. Let stand 5 minutes. Enjoy! This is so simple, yet it is so good that the family will think you spent hours fixing this yummy concoction. DISCLAIMER: I wrote this review while participating in a campaign by Mom Central Consulting on behalf of Mrs. Dash and received a gift certificate to thank me for taking the time to participate. I was also sent the flavors of Philadelphia Cooking Cream by Kraft. I am an exclusive Delicious Byte blogger with Kraft Foods. Sounds wonderful- I add smoked Paprika – it really enhances any beef dish. I love Strogonoff and I love Mrs Dash. Congraulations on receiving recognition for your recipe. I am a huge fan of cooking wnderful meals that taste like they have taken hours to cook, but actually didn’t. Thanks for posting this recipe. I will definately include this into our monthly rotation.. I like to add mushrooms to my stroganoff. It helps stretch a small amount of meat across more servings. This looks really tasty though and I love how quickly it comes together. We don’t like mushrooms 🙂 Well, the kids don’t like the texture of them, I can usually get away with the gravy as long as the bits are really tiny. Since all of my recipes are things my boys eat, the mushrooms didn’t make it into this recipe. LOL!